I hope you all are having a wonderful festive time, among the festivities I got an hours fresh air outside earlier when I fixed myself up with a very nice additional antenna. Its coming up to about a month since I installed my old YAESU FT-890 neatly in the corner of our dinning/craft hobby room. I had strung up a 20 meter dipole at first and made a few qso's into Europe but noticed I was picking up some noise which spoiled the reception quality. I changed antenna's from the dipole to a delta loop to compare and as expected the delta loop was much better with hardly any noise. I tested the loop for about a week until the YL noticed a corner tied off to the washing line pole which resulted in the "look" which translates to "move it now". So today I got my weights and rope along with the delta loop and began throwing a weighted rope up into a big tree which is part of a wooded area at the bottom of my garden. The land after my wall is a steep banking that slopes away into the woodland and is perfect for wire antennas and loops providing them with a nicely elevated take off. I am pleased with the configuration that I managed which is a vertically mounted corner fed, inverted triangle - Delta Loop. The wire is hard drawn copper which was left over from an earlier project, the dimensions are indicated in the illustration pictured above. I created the Delta Loop Instal illustration using google draw. I have fed my new delta loop with around about 100ft of 50 ohm heavy coax terminating into a homemade 1:1 balun at the delta loops feed point and back inside to my nevada tm1000 tuner. 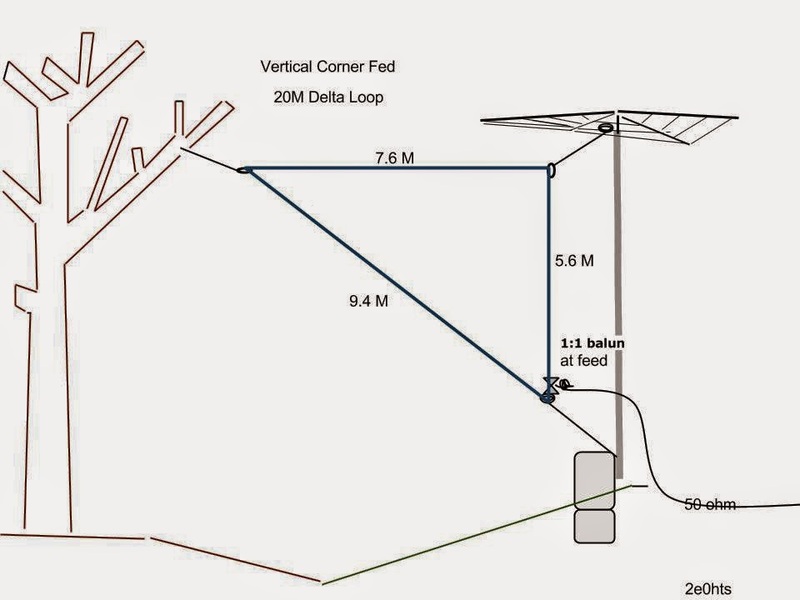 My home made Delta loop is mounted using insulators and nylon guy strings that connect to the tree and CobWeb antenna mast as seen in the above illustration.The SWR is at 2.0 on 20M as I made it slightly longer to allow final adjustments which I shall do later, my tuner is good for now. does it need a matching or a transformer 4:1 ? Mobiling into PT Land Brazil! Solar Max - Good DX Opportunities?